WACO, Texas—A high school senior from Grapeland took home first place and a $4,000 scholarship as winner of the 2012 Free Enterprise Speech Contest at the 79th Texas Farm Bureau annual meeting in Waco. Julie Riess, 17, daughter of Barrett and Margaret Riess of Grapeland, topped 10 other speakers from across Texas in the annual contest. At Grapeland High School, she is president of the FFA, class president, cheerleading captain, volleyball captain and president of the Beta Club. She also is active in softball, powerlifting and Fellowship of Christian Athletes. Riess plans to attend The University of Texas at Austin and major in business. She hopes to become an actuary or accountant. Runner-up in the Dec. 1 contest and winner of a $2,500 scholarship was John Brooks, 17, a high school junior from Lometa in Lampasas County. The son of Jimmy and Mary Hicks, he plans to attend college and major in political science. Brooks is active in speech and debate at Lometa ISD. He shows swine and placed second at the San Antonio Stock Show and fourth at the Fort Worth Stock Show. Four other finalists were named, including Rebecca Burt of Lamb County, Jacob Long of Kaufman County, Jaclyn Bonner of Atascosa County, and McCalley Cunningham or Goliad County. They won $1,500 scholarships. Other contestants and winners of $1,000 scholarships were Danielle Heater of Hutchinson County, Emily Fouts of Haskell County, Shelby Downs of Lamar County, Caleb Posey of Fisher County, and Riddhi Jani of Matagorda County. 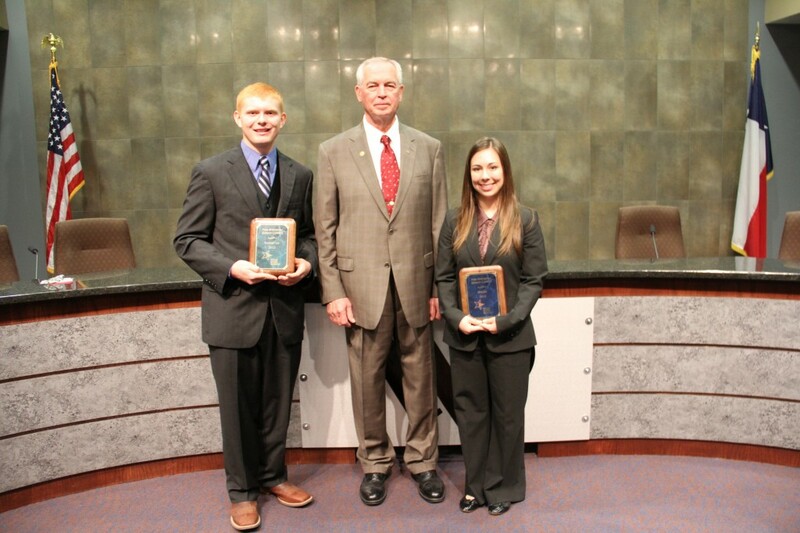 Texas Farm Bureau (TFB) President Kenneth Dierschke (center) congratulates the 2012 Free Enterprise Speech Contest winner Julie Riess of Grapeland (right) and runner-up John Brooks of Lometa (left) during the 79th TFB Annual Meeting in Waco.